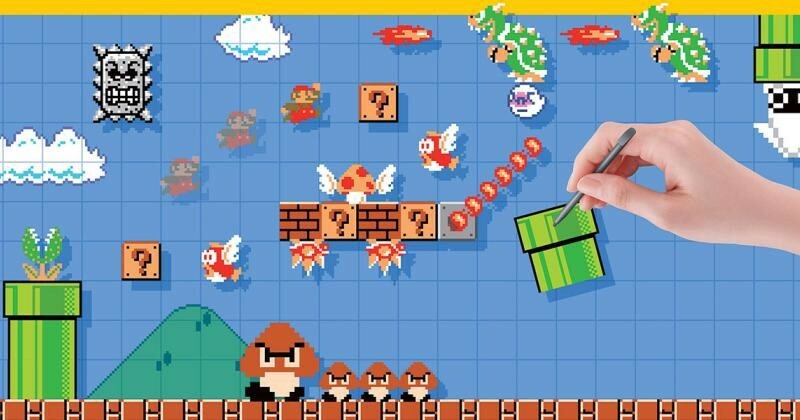 It has been the dream of most Nintendo fans for many years: being able to make your own Super Mario levels. With Super Mario Maker (SMM), that’s finally possible. However, I’ve been making Mario levels in a browser game called Super Mario Flash for quite a while, and the two are pretty similar in both concept and execution. You don’t need to know anything about coding to make levels, you simply can place blocks, enemies and power-ups in the already existing level environment. It’s understandable why Nintendo waited so long with releasing these tools, because the game makes great use of the controller’s screen. Console and game are made for each other, so it seems. Although there isn’t a tutorial, you won’t be thrown into the deep end either. The game starts with a course you can’t clear, because the final jump is too large and it’s up to you to change that. Only just the basic tools are given to you at first, so it’s really easy to get started. Originally, you had to play for more than a week to unlock all the possibilities, but a day-one-patch changed that. Now it’s a matter of a few hours, although you can easily trick the system by manipulating the console time. Simply filling the level with ground blocks seems to work as well. Personally, I like it. This way I can create simplistic, but challenging levels, without thinking about the possible mayhem I could create with all these items and enemies. So, while creating a level is easy, creating an easy level isn’t. Creating a level requires a lot of playtesting, which luckily isn’t a big hassle, because you can jump into a level at any point you want. Besides that, you can use a tool that shows the trace of Mario’s moves, so you can easily see where you need to place the next block. However, because you play your own level so often, you get really good at it or you might forget about that hard part in the beginning, because you jump in halfway. As of now, there are no checkpoints like in recent Mario games, so if the player dies, he needs to start over from the beginning. Creating a hard level is pretty easy: just place less blocks and more enemies. What’s key to making a level is keeping your audience in mind. Are you creating a level for your brother, the rest of the world, or perhaps your mother who never played a game before? That’s the moment when you really start thinking about the design process. And it’s pretty tricky. One of my levels that I published turned out to be harder than I thought it was. Sure, you need to be able to clear the course in order to publish it, but I got used to the rhythm of the jumps. Course World is the place where you can share your own levels and play ones made by others. 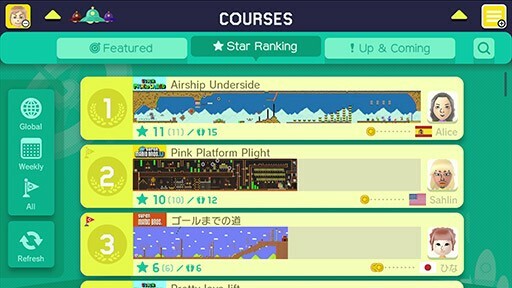 You can upload 10 levels, but if you get enough stars, the rating system in the game, you can upload more. The biggest problem right now is that many top levels are automatic levels, or roller coaster rides you actually don’t have to play. You just watch. While most are fun and extremely well made, it’s hard to find real, more traditional levels. Super Mario Maker is a never ending Mario game with some opportunities for DLC in the future. A level you already played completely changes when you switch from the original Super Mario Bros. theme to New Super Mario Bros. style. Overall, it’s extremely fun to make levels and play ones made by others.